To use Yuzinji you must buy a license for Structure101g Studio plus a license for the InterSystems Caché language plugin. Licenses are per named-user. For more information see the End User License Agreement. Visit the Structure101 site for prices and purchasing options, including online purchasing. Take care to look at the section for the generic edition, Structure101g Studio, rather than for the editions for Java and .Net. 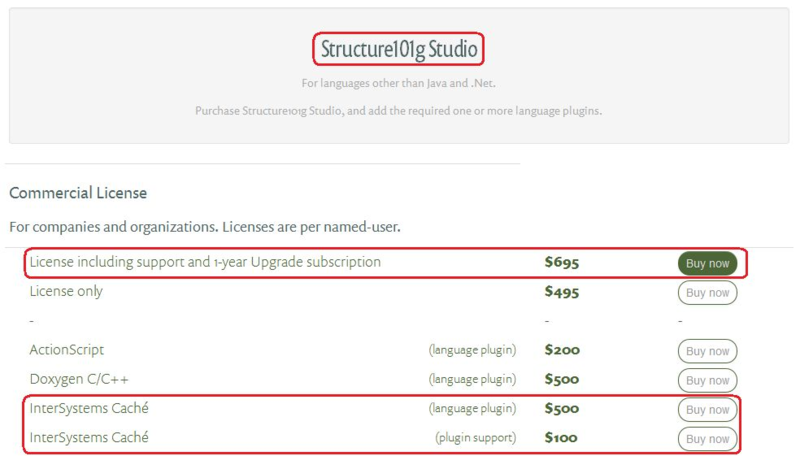 We recommend you purchase your Structure101g Studio license with support and 1-year Upgrade subscription included, and also that you add the plugin support option for the InterSystems Caché plugin. Image: Selecting to purchase Yuzinji on the Structure101 website. If you are unable to purchase Yuzinji through the Structure101 site, or if you need further advice, please contact us.